We are taking a different approach with the preview for the massive Southern Section, breaking it up by divisions and breaking those divisions up by competitive "tiers" or projected levels of competitive ability. Here is Division I girls. Great Oak - No surprises here as this should be Great Oak's 10th divisional title over the past 11 seasons! Reread that to yourself and step back. ... On top of that, this could very well be their best squad yet as they are one of the top teams in the nation, going into the 2018 season. The trio of Tori Gaitan, Fatima Cortes and Arianna Griffiths are coming off the most impressive track seasons in national history while all going under 4:50 in the same race. Gaitan walked away with 4:47/10:17 bests while Cortes left the season with 4:46/10:25 credentials. Cortes is the defending divisional champ, running the second-best time in the section at 16:27. Running a 17:57 at finals, Griffiths stepped up with a 4:47/10:32 season this spring as well. The accolades seem endless at this point with the Wolfpack, which had 17 underclassmen break 11:50 and 13 break 5:30. The only head coach in the program's history, Doug Soles is impressed with the supporting cast molding themselves behind their upfront trio. Audrey Dang returns with NXN experience and a 5:08/10:53 spring while she rolled to a 17:52 last postseason. Sophomores Brianna Weidler (5:10/11:16), Sophie Rodriguez, Kylie Weidler and junior Aubrey Nex are pegged to provide additional support. Brianna Lucas also returns with an 18:04 best last postseason. We're projecting all seven to finish among the top 25 at the divisional finals while probably running with another sub-40 point tally. 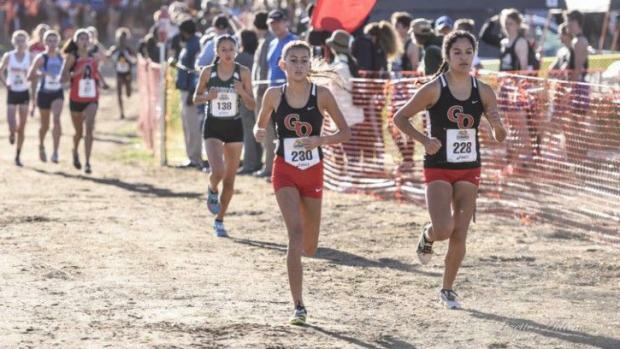 Great Oak won't necessarily look past the divisional finals, but all eyes and goals are set for December and how they perform at the Nike XC Nationals. Vista Murrieta - The Broncos return five from their state meet squad from 2017. Taking 2nd place last year, and looking to replace their No. 2 scorer during the postseason, Vista Murrieta should be well on its way to an 10th straight trip to the State meet. Seemingly in the shadow of Great Oak, the crew welcomes incoming freshman Devyn Candaele into the varsity mix. Paige Haynes returns as one of the division's best (17:25 at last year's finals) after cautiously taking the track season off. Meanwhile, possessing one of the most condensed scoring packs in the state a year ago, we don't see too much changing this season. The Broncos return four others that all ran between 18:11 and 18:16 on the Riverside Championship Course last postseason. Makayla Fick and Peyton Candaele shined in the 800 this past spring while Gaby Hubarth and Aniya Pretlow showed some nice improvement in the longer distances. Bring back in Haynes, along with an incoming freshman that will add to the pack and Vista Murrieta could very well find itself taking home the runner-up plaque for the third time in four seasons. Walnut - After four scorers last year, Walnut was within the top three squads and on its way to the State meet. But, as we all know, the sport is dictated by five scorers and Walnut fell back to 8th place. Walnut returns their entire crew from last year and in position to claim a spot in the top five. Two-time CIF champion and three-time State meet qualifier, Chloe Arriaga (4:57/10:50) enters her senior year with twin sister, Emma Arriaga (2:14/5:08/11:06). The two project to be in the top five this November once again, while both looked sharp this past track season. In regard to this past track season, Walnut came away with the best stats aside from Great Oak. Anastacia Sloan had a great freshman that saw her post 5:14 and 11:08 to her resume. Meanwhile, Amanda Ghibaudo came away with 5:15/11:25 marks. Both went 18:20 and 18:30, respectively last postseason. 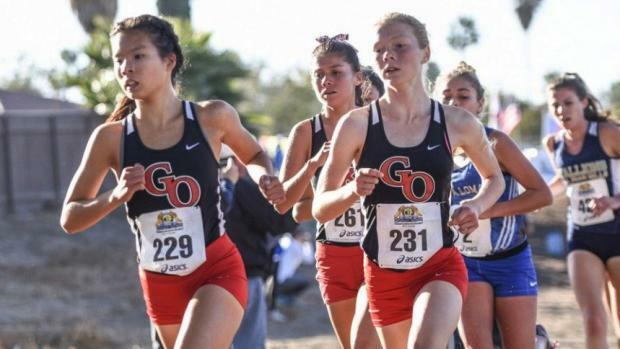 Walnut 's three other returners all posted 12:34 marks for the 3200 this past Spring and poised to ensure that the entire teams makes its way up to Fresno this November. Mira Costa - Coming back from their 6th place finish a year ago, the Mustangs return eight of their top nine from last year's postseason run. This should be their sixth trip in the past seven seasons to the State meet and 10th from the last 12 seasons. Coach Renee Williams-Smith has always done an incredible job with the Mira Costa girls' teams but this season may be one of her best squads yet. Their trio up front in Olivia Hacohen (18:01), Brooke Inouye (18:04) and Lucy Atkinson (18:06) place right up top along with Walnut. All three had impressive track seasons Cara Chittenden, Pnina Tofler, Tia Pappas and Anna Graves all return as well as Mira Costa brings back as much experience as you're going to find in the division. With not much separating the squads in this tier, don't be surprised if the Mustangs rise to the top of it come November. Redondo Union - The Sea Hawks return their top six from a year ago and have all of the pieces to rise into the top five after taking 9th place in 2017. If so, it will be the first time Redondo has returned to the State meet since 2014. They had seven seasons (2008-2014) where they qualified for the State meet out of Division II. With Lila Copeland (17:43 last postseason) no longer with the squad, one would cast Redondo into a lower tier. But, Peyton Heiden (5:01), Isabella Landry (5:05), and Molly Anne Hastings (5:14/11:25) are coming off solid track seasons. With the spring season geared more toward the 800/1600 specialities in the Bob Leetch program, do not get caught simply glancing at their 3200 meter stats. As Kasey Bohney and Shelby Bender impressed as well, Leetch is very pleased with the development of Montgomery Allison as she will be a major factor. Jaclyn Steenson continues to improve while Dominica Villegas is also going to be in the varsity mix after a 2:18 track season. Despite losing one of the division's best, do not discount the talent on the Redondo squad here in 2018. Fountain Valley - The Barons return their top nine from their 10th place team in 2017. After a long hiatus, this team will qualify for the divisional finals for a third straight season. Ashley Faller leads the squad as they seek their first trip to the State meet since 2007. Faller's 5:20/11:06 season places her amongst the top 15 coming into the season. On paper, the crew falls just short of being in the top tier, but as a whole, they put together one of the best track seasons in the division. Sara Feitz (5:14/11:41), Isabella Guerra (5:19/11:45), and Julia Svartstrom (5:20/11:47) are huge indicators of the talent this team possesses (and what could be a very nice pack based on those 3200s). Maddie Jahshan 5:31/11:55 will also be right up there to complete their scoring five. Head coaches, Jerry Palazzo and Brian Bivens also mentioned that they expect at least two incoming freshman to also be in the varsity mix. Dana Hills - The Dolphins seek a third straight trip to the State meet but will have their hands full from the other programs in this wide open group. This should be their 12th year in a row finishing in the top 10 while they do return seven of their top eight from last year (even with a subpar performance at finals). What is concerning was the lackluster track season the crew put together with only one returner breaking 11:45 and only two breaking 5:20. But, looking back on last November, Leila Keyvan (17:54), Sarah Meng (18:04), Lauren Soto (18:25), Marisa Gaitan (18:29) and Anna Fodor (18:31) form a solid five that places them in the mix with the divisions' best squads. Gaitan had the best track season of the group posting 5:14/11:38 splits while Megan Geiger showed tremendous improvement with an 11:49 best. Tradition and consistency is on the Dolphins' side as they seek 14th trip to the state meet in the last 19 seasons. Ayala - This will be their 19th straight season of advancing onto to the divisional prelims. No other large schools' program can make that claim. The Bulldogs return their top four from last year's 14th place finish while we were impressed with their group this past track season. Mikaela Ramirez is coming off a monster track season where she posted 4:48 and 10:26 bests, establishing herself as one of the best in the section. Erin Facenda (5:17/11:33) and Shaina Berk (5:22/11:39) showed great improvement in the spring. Sophia Byers and Cadence Chang both ran 18:57 at a recent 5K while Ayala has developed some solid depth that they've been lacking the last several years. Six others all ran between 20:18 and 20:59 which prompted us to move them up to the next tier and be right there competing for a state meet spot. Head coach, Tony DiMarco is very pleased with the development of his girls' team. He mentioned how this squad is more focused and driven than any other he's ever coached and feels that they could very well be the best team in their school's history. Tesoro - A team that did not qualify for the postseason last year can be in the mix for a State meet berth in this division? Looking at last year, one could easily overlook the Titans as they were missing their top two runners the last month of the season. Clara Mead is coming off a solid 5:13/11:31 track season while she had to cut her season short a year ago. Meanwhile, Tesoro welcomes back Catherine McGettigan who did not compete all of last year. She owns personal bests of 5:09 and 11:03 while she rolled to a 17:54 two seasons ago. Bradi and Karli Steinhardt along with Rilee Brentlinger return after impressive track seasons. Head coach, Courtney Sharar, is happy with the training of seniors Amanda Grady and Sarah Jamil. She anticipates incoming freshman, Ava Christman, will also be in the varsity mix once the season begins. This should be their 7th time in nine seasons that the Titans qualify for the divisional finals. Santiago - The Sharks of Corona return their entire group from last year's 12th place team. As they underperformed at last year's finals, this will be their third year in a row in the mix with the division's best. Sophomore Diana Bautista leads the squad and is coming off a 5:20/11:36 track season. Not 100% healthy last November, watch for Samantha Velazquez to be right up front as well. She put together a 5:12/11:30 season this past spring and surprise a few out there. Kateyln Meza, Riley Corcoran, Madison Oswalt, Cayla Etheridge and Jessica Brazeau all return as they seek their first State meet berth in program history. Meza is coming off a 5:39/11:46 track season. Riverside ML King - The crew that quietly stayed under the radar in 2017 only to emerge with a 5th place finish and second straight trip to the State meet. They will have to manage the graduation of two while another transferred with her family out of state. Lauren Peurifoy is back to help lead this group, but expect Kela Mavhera to be up front with her. Mavhera's 5:06/11:21 track season displayed her talent as she was injured during the 2017 regular season. Amanda Sosa continues to improve while Joanie Green and Jenna Bernath will round out the scoring five going into the season. Despite the losses, this crew will be back to the finals for the ninth time in the past 13 seasons. Burbank - Return seven of their top eight from last year's postseason. As a whole, the crew underperformed in their 20th place finish last year. Meanwhile, they did put up their best track season in recent memory. The Bulldogs are led by Sol Fernandez who has an 18:19 on the Riverside Championship Course. But, Shalom Mejia has joined her up front this summer. Noela Kim, Lydia Forsyth, Jamie Levin, Natalie Danao and Raquel Goli are projected to be their top seven going into the season. Head Coach Kathy Nelson referenced how a healthy Danao will make the team more competitive this season. Expect this crew to be fighting for a top ten spot come November. Chino Hills - This should be their third straight season that the Huskies advance to the divisional finals. Jacqueline Duarte stole the headlines last November in advancing to the State meet as an individual while the team finished in 13th place. Duarte continued to steal more attention this past track season, but away from the elites in California in her 4:44 ascension over the last month of the season. While they graduated three from last year's crew, the Huskies return enough to support Duarte and a return back to the finals. Lauren Jauregui and Miranda McGarry should be in the mid-18 minute range and put them in good shape. California - The Condors must replace graduating three of their top six from the 2017 postseason. Despite those losses, this crew has the depth of returning to the second straight finals as last year's 17th place finish was their first in school history. Stephanie Reynoso has a postseason best of 18:29. Sandra Ramirez and Isabella Garcia are coming off sub-12:00 minute track seasons. Meanwhile, Ashley Moya recently ran into the low 20's for a 5k. Yucaipa - The Thunderbirds are coming off an 11th place finish from a year ago. They will have to replace three of the scoring five from a year ago. Danielle Gee is among the division's best and posted 5:07/10:59 marks this past track season. Sydney Sandoval was impressive this past spring with 5:24/11:41 marks while Anne Schmidt improved down to a 5:44 on the track. We'll need to see some improvement on the back end for Yucaipa's returners but with more depth than most, we project Yucaipa to return to an eighth straight finals berth. Warren - The Bears should have enough weapons to return back to the finals after taking 18th place a year ago. If so, it will be their eighth time in the past 11 seasons. Nadine Gomez returns as their top girl with an 18:06 best on the Riverside Championship course. But, we project moving up after her solid 5:16/11:02 track season. Gomez will be in the mix for an individual berth to the State meet. Natalie Esparza, Valeria Guerra and Arianna Cervantes return with postseason experience. Guerra improved down to a 5:32 this past spring.